In January, I went to New York for the first time ever. It was amazing. I love-love-loved it. Tuesday morning, I got up at 6 a.m. and went and stood outside the G.E. Building, where NBC Studios is located and where they hand out Late Night with Conan O'Brien stand-by tickets at 9 a.m. They hand out numbered tickets. The numbers correspond to your place in line. My ticket said "1" because I was the first in line. Then I went back to the G.E. Building at 4:15 and waited in line. After a while, everyone but the first seven people were told they had no chance of getting in and were told to either leave or go to a taping of Last Call With Carson Daly, which had plenty of openings because, well, because it's Last Call With Carson Daly. After I'd waited in line for about an hour, I was told that no stand-by people were going to be let in to see Conan, so I left. The next morning, I got up at 6 again and stood in line again and got stand-by ticket No. 1 again. I went through the whole thing again, but this time much of the stand-by line got in to see the show. I was the first stand-by person to be let into the studio, so I got to sit in the best seat that was left, which was in the third row on the aisle. While we waited, the band came out and played some great hoppin' tunes. The band sounds amazing in the studio. The trumpet player was especially impressive. Then the guy who plays Preparation H Raymond on the show came out and did the warm-up. He was really quick and funny. He asked some people where they were from and that kind of thing, but it wasn't corny like you'd think it would be. He was hilarious. Then Conan came out and interacted with the audience. It was about 5:15 at this point, and the show started taping at 5:30. Conan's face was a veil of makeup. He had a lot of energy and was tossing off hilarious jokes left and right. Then he looked right at me and asked if I was excited to be there (or some such thing; I don't remember exactly what he said). Then he said something like, "Excited enough to dance?" So then he had me stand up and the two of us danced to the music the band was playing. I threw myself into the spirit of the thing and really went kind of wild. Conan stopped me, saying, "Whoa! What was that?" Then he said, "Oh man. That took guts. Give me a hug. I love you, man!" I hugged him and said, "I love you, dude!" into his ear. Conan said, "Let's hold the hug until it starts to get really awkward and the audience starts getting creeped out." So we held it and held it. Finally, the hug ended and Conan had me go hug some other man in the audience. Later, Conan had another male audience member hug Max Weinberg. Conan must have been in a real huggy mood that day. Or maybe he's always like that. Who knows? Soon afterward, the show started, and Conan was great. During commercial breaks, Conan would kind of do a huddle with various people who worked on the show, discussing upcoming bits or what-have-you. During the second interview, a camera Conan tried to do a take in wasn't ready and so the funny thing Conan had tried to do didn't work. This visibly annoyed Conan, but only for a fraction of a second. During the following commercial break, Conan got up and talked to the producer about it. 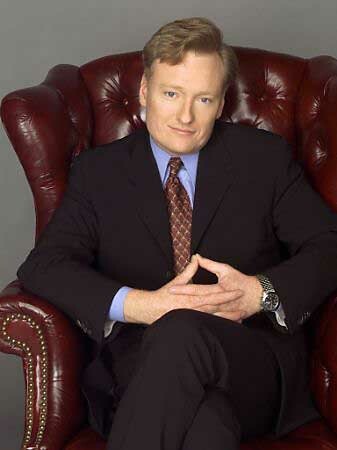 He was annoyed, but when the show came back from commercial, Conan was his old funny self again. During the last commercial break, I heard Conan say to a cue-card guy, "I can't see that card at all." Not that exciting maybe, but true. Anyway, that's my Conan experience. By the way, I'd tell you who the guests were on the show that night, but I don't remember their names. I'd never heard of them before. The first guest was a singer/songwriter dude. The second was some guy in the Phantom of the Opera movie. Then there was a rap-style duo on at the end. They did a song/rap thing. I didn't care that I didn't know the guests, though. I was there to see Conan. Whom I hugged.